Hello everyone! I hope this finds you well and thank you for letting me join you again! I have had this new gem on my bench...well, for months. Life gets busy and, there was always tomorrow. Finally, they actually yelled at me and said I needed to come play! So, I did. It was a good reminder for me to slow down as I whirr through my busy days. I've spent the past few weeks getting to know my new friends. Very earthy, very grounding and, they helped me to let go of some past emotional issues hiding in the background. It's been a nice clearing of old 'stuff,' a benefit I wasn't expecting. Dravite is best known as the ‘Brown Tourmaline’ and probably one of the least known Tourmaline varieties. Crystals from certain localities can be very lustrous and beautifully crystallized. It received its name after Dravograd, Slovenia, the area where Dravite was first described and named in 1883 by Gustav Tschermak for the river Drau (Latin meaning of Drave). It normally occurs in granite pegmatites, or in granites that have undergone metasomarism by boron-bearing fluids (change in the composition of a rock as a result of the introduction or removal of chemical constituents). It can also be found in sediments adjacent to these granites. Dravite has an Isometric Crystal System and is in the Tourmaline family. Generally they are what is called prismatic, meaning they have four or more sides similar in length and width and are usually elongated in one direction. The most common form of Dravite is columnar, having parallel, slender, compact, adjoining crystal formations. 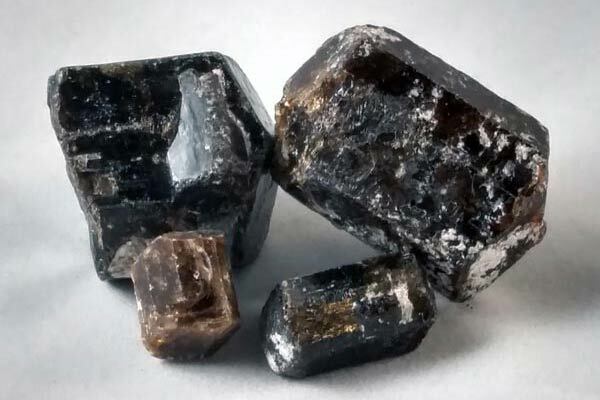 Dravite’s coloring can range from dark yellow, to deep brown, to almost appearing black. Much of it’s shading depends on how much iron is present. Less iron brings the more yellow (Champagne Tourmaline) and having more iron, the lovely brown coloring.